Hit a few holes on the green and tie the knot at The Cape Club. Celebrate in a casual-yet-elegant setting, perfect for grand or intimate “I do’s.” Get ready for the big day in the luxurious bridal suite, or enjoy a round of golf, tennis match or lively game of croquet before getting hitched. At The Cape Club, quintessential New England style and fresh air fun are truly a match made in heaven. Bruna Pinheiro (31 and an accountant) and Patrick Haley (31 and a sales and marketing director) met at a bar in Boston where Pat asked for Bruna's phone number. The next day, he messaged Bruna asking her to have dinner with him at his house. Bruna shied away from Pat's request and continued to do so for a couple more times until Pat decided to give up. About four months later, Bruna decided to reach out to Pat and they ended up setting up their first date. After moving to Oregon to start a new adventure together, Pat surprised Bruna with a vacation to Hawaii where he proposed overlooking a beautiful sunset. They decided to have their wedding at The Cape Club, formerly known as the Ballymeade Country Club, in East Falmouth, Massachusetts where their love of the beach and Cape Cod could come together. "I've always pictured having my wedding ceremony at the beach," Bruna says, "so it made sense to combine our love for the beach with a place we've always enjoyed." 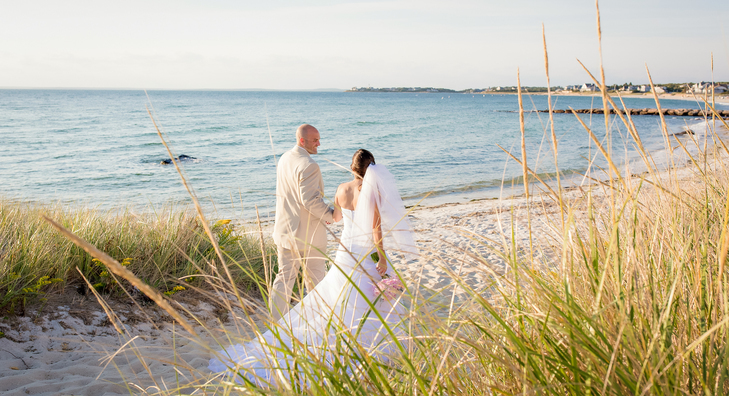 The wedding ceremony was held outdoors on Old Silver Beach just steps away from the reception at The Cape Club. Bruna and Pat opted for a beach theme for their wedding with a color palette of Bruna's favorite color, aqua blue, and pink. Now that they live in Oregon, they had to plan their entire wedding from across the country. "Planning a wedding long distance is tough," Bruna says, "especially when it comes to little touches and decorations." The reception was kept simple but inviting and decorated with candle light and starfish details following the beach theme. "Wedding planning is a lot of work," Bruna says, "but at the end of the day, it is all worth it!"